Please Blog Responsibly « Eric Anthony Grollman, Ph.D. In an earlier post, I made my position clear — there are many reasons to blog as an academic. Let’s be honest, it takes a long time to get one’s research published in as an article or book. And, despite the amount of preparation (and grading…) that goes into teaching, we really only covering a slice of an entire field or subfield. And, our scholarship and teaching tends to stick behind paywalls; only those with access to academic journals and only those enrolled in college have the luxury of accessing them. And, don’t even bother thinking service is can to anything other than your department, university, or discipline. So, blogging can serve as means to make scholarship, teaching, and advocacy more accessible. You can complement peer-reviewed journals articles behind paywalls with a short blog post summary of your research. This is true, too, for teaching (i.e., short post to introduce concepts or review prior scholarship) and service (i.e., blogging as intellectual activism). Or, blogging can feature aspects of your scholarship or advocacy that are outside of your typical work. But, as with any sort of unregulated, non-reviewed, and public writing, academics who blog should seriously consider a few points of caution. Some of these I have worried over for some time, others are lessons learned from recent events. It Doesn’t Count. Unfortunately, there is little chance that your blogging will “count” in evaluation for jobs, tenure, promotion, or other academic milestones. It does not constitute peer-reviewed scholarship. It does not constitute teaching. And, I would guess that few departments would even count it as service. If it serves as an important part of your scholarship — for me, I stand by it as a form of intellectual activism — it is at least worth finding out whether your department or university would recognize it as something more than a personal hobby. I am happy that mine see it as a form of service, so I continue to list this blog (as well as my time with KinseyConfidential.org) as service on my CV. But, It Does Count. Although blogging may not officially count in your favor, it could unofficially count against you (how about that…). One’s colleagues and/or advisers may see regular blogging as a cute little hobby, but I fear their opinion about what you write could trickle into formal, “objective” evaluations. The new reality for the job market is one’s submitted application and anything accessible on the internet is fair game in search committee’s decision-making. (And, sometimes steps are taken to dig into not-so-public information on the web, i.e., via Facebook networks.) Besides the content, frequent blogging may also send the message that you are “wasting” precious time that could go toward your research. And, let’s not forget that our students are savvy enough to enter your name into Google and hit “Search.” I learned early on that I had students who were regular readers of my blogging for Kinsey Confidential; fortunately, they enjoyed my blog posts, and it seemed to add to my credibility in my course on sexualities. You May Make Enemies. I have been pleasantly surprised to receive many compliments, praise, and even fan-mail for the (successful, I’d say) creation of Conditionally Accepted. And, my network of friends and colleagues has expanded through (and because of) my blogging and other social media use. But, others may begin to take you seriously enough to disagree with you. This may mean sometimes tense online conversations with other scholars. Or, you may become the subject of publicly expressed hostility. Even scarier for me was being called out by white supremacists; that made my heart race a little for fear of any physical harm. You Might Get Sued. I knew you could piss people off as a blogger. But, no one told me you could be sued! I was not-so-pleasantly surprised several weeks ago to find an email threatening legal action unless I removed text from an old blog post. No, not copyright infringement style — slander! (Fortunately, that crisis was avoided.) I certainly wear descriptions like “provocative” with a badge of honor, but I would never aim to tarnish someone’s name, image, or reputation. So, I am speaking from experience. It is possible, so be careful in how you speak about other people, even if you are simply quoting publicly accessible information. I also recommend obtaining umbrella insurance (that covers civil legal action like slander and libel) if you can afford it. Stay In Your Lane! My biggest gripe, the one that has driven almost every blogging battle I have had with other scholars, is writing outside of your own expertise. With the respect and privilege afforded to PhDs (and, to a substantially lesser extent, future PhDs), I fear it is likely that any scholar’s written words can be taken unquestionably as expert opinion, even Truth. A few bad apples aside, the peer-review system bolsters confidence in researchers’ expertise. But, there is no peer-review for blogging. Besides the pressure not to blog at all, the failure of academic institutions to value it places no other constraints on what scholars blog about. So, aside from harm to your professional reputation, biologists may write film critiques and English professors could develop new theory on evolution. I assume those examples are a bit extreme. But, I have seen colleagues veer slightly out of their own subfield. Staying safely within their discipline, they begin (maybe unintentionally) speaking as an expert on areas outside of their own training, research, and teaching. what really irritates me is their angered response when they are called on it. A polite request to “stay in one’s lane,” to allow people with more expertise to weigh in, are met with an effort to teach you a thing or two. I am not asking to add to the many ways in which “academic freedom” is already constrained. But, I call for a bit of reflection and responsibility here. Your public writing carries a certain level of weight and authority as an intellectual. It may be best to at least preface a post with “I am not an expert on this…” or conclude with links to others’ work or simply let the real experts do the writing. Frankly, I feel one of the greatest abilities of an intellectual is to know the limits of one’s expertise. The aforementioned points of caution aside, I strongly encourage scholars to blog, however (in)frequently. I know of many pseudonymous bloggers, which allows some level of protection (but, it is not full-proof) for those worried about professional harm. If you simply want to write a blog post — just one — without maintaining your own blog, there are sites (like this one!) that would gladly feature a guest blog post. And, while blogging is not formally valued in academia, it can increase your visibility as a scholar, maybe even further demonstrate your expertise, and lead to invitations to either cite blog posts or publish them. So, give it a try — what are you waiting for?! “Sociological Images: Blogging as Public Sociology” by Drs. Lisa Wade and Gwen Sharp in Social Science Computer Review (regarding their successful accessible blog, Sociological Images). “Illustrated Blogging Advice for Researchers” from Just Publics @ 365 (compiled by Dr. Jessie Daniels, who blogs at Racism Review). “Why Blogging is Great, and Tips for Starting” at SoapboxScience (at nature.com). “5 Ways Blogging Has Made Me a Better Scholar” by Balancing Jane. Advice on blogging from Northwest History. 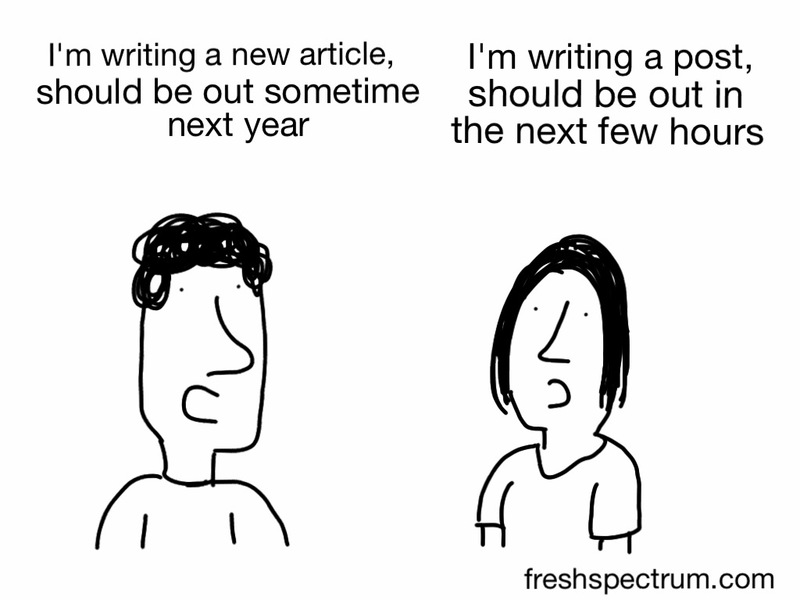 “So, You Want to Start an Academic Blog? Four Tips to Know Before You Start” from Dr. Tanya Golash-Boza. “So You Want to Blog (Academic Edition)” from University of Venus (at Inside Higher Ed). “How Blogging Helped Me Write My Dissertation” by Maxime Larivé (at Chronicle of Higher Ed). Tenured Radical expresses similar thoughts, too. By Dr. Eric Anthony Grollman in Activism, Authenticity and Voice, Discrimination and Bias, job market, Public Scholarship, Research and Writing, Social Media, Teaching and Mentoring, tenure-track on February 6, 2014 . Loved this! Even though I am leaving the academy, I do have the desire to keep some kind of research agenda going on, but am not entirely sure I want to subject myself to the maddening academic publishing process. Blogging keeps coming up as a “why not”? option in my mind. Thanks for modeling and validating this medium as a ‘respectable,’ constructive (and even defiant!) way of doing and sharing research beyond the Ivory Tower. Great post on the benefits of blogging. It is the only form of social media engagement that I have yet to fully participate in, but I most certainly recognize the positive implications of doing so–especially as a scholar-practitioner.